Hydrostatic pressure on the outside of your home’s structure, from the soil and ground around the base of your home’s structure, can often cause cracks to form in your home’s foundation skirt. Gravity will inevitably pull drainage along the path of least resistance, and if your home’s skirt is leaking, the water will find its way into these cracks in your basement’s wall and collect in the space below your house. In addition to visible cracks and fissures in the foundation blocks, some of the common signs of leaky cracks include water stains on the sides of the foundation wall which indicates the presence of drainage. Eventually, the drainage which has collected in the area under your house might create a suitable environment for mold or mildew, and wooden structural elements damaged by rot can lessen the stability of your home. There are a wide variety of reliable solutions to issues related to leaky cracks, including the installation of carbon fiber strips which will support the strength of the foundation walls while relieving hyrdostatic pressure. For most of our clients, alleviating this pressure will help prevent further problems with the foundation footer and basement walls. 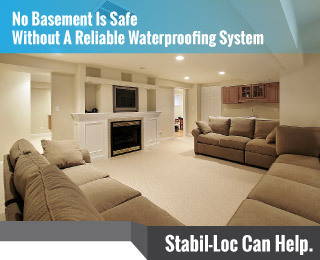 On the outside of your home’s foundation, we in most cases suggest the installation of a water-proof membrane along the exterior of the foundation which will keep drainage from seeping from the earth into the cracks in your foundation or basement walls. In the area below your home, we can install drains which will guide moisture into a sump pump system which will quickly remove the moisture from your crawl space or basement area.